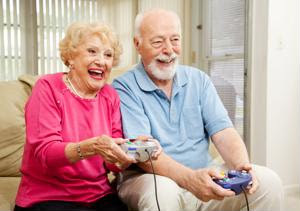 As an at-home senior care provider, video games are probably not the first thing that comes to mind when you're brainstorming ways to get your client active and excited. But did you know that several nursing homes have embraced the Nintendo Wii for just that reason? A study done by the National Council of Strength and Fitness in 2011 found that "exergames," or video games that incorporate fitness, while not great to replace workouts for younger people, were a great exercise option for seniors who should be sticking to less intense workouts. The study found that seniors who played Wii Fit had drastically improved balance, coordination and mobility. Is the Wii right for your client? While your client may not be able to do activities that are too strenuous, it's likely that they could find an activity on Wii Fit that they'd enjoy. The bowling and golf games both involve very basic actions, and can even be played while sitting down if your client has problems standing for any length of time. Wii can help get your client a little more active and engaged, but in the end you know their limits better than others. If you have any concerns about your client using the Wii for some physical activity, be sure to check in with their doctor to get an OK first.